West Seattle Kiwanis member and resident Michael LaFranchi does not like to boast about his former career in the State Department Bureau of Diplomatic Security. 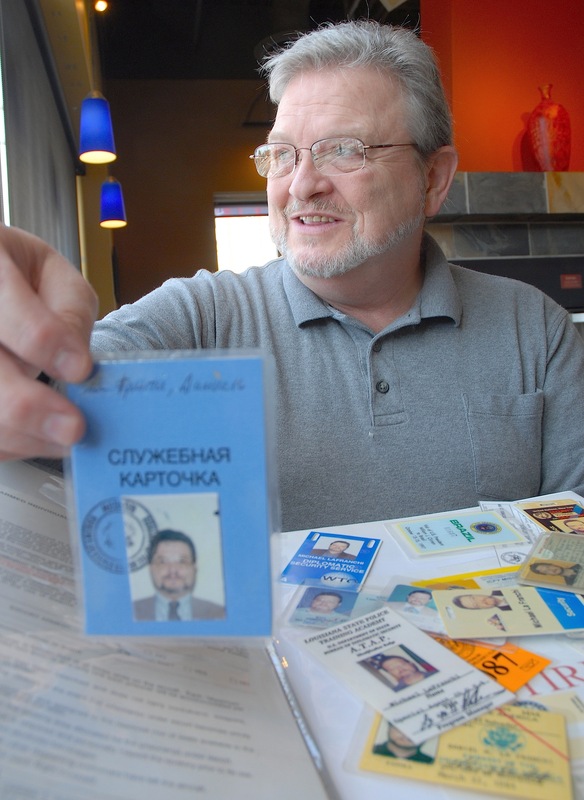 But if pressed, he might show you his 1990-1993 pass, pictured in his hand, issued to him when he ran the Frankfort regional counter-intelligence center and investigated the activities of local nationals in our embassies of former Eastern Block nations. You need not twist Mike LaFranchi’s arm to get him to talk about his West Seattle Kiwanis membership, where he is a past-president, or his weekly volunteering at the Friends of the Library Book Sale sorting facility in Magnuson Park. He is loud and proud about those accomplishments. More challenging is getting the mild-mannered Junction-area resident to spill about his 26 years in the State Department’s Bureau of Diplomatic Security, formerly the Office of Security until 1985, when he guarded the likes of Nelson Mandela, Princess Anne, Yasser Arafat, President Clinton, and rode herd over the security of countless embassies and consulates from Cape Verde to Mongolia. He was first assigned in 1974. “The whole secret of being a good special agent is having a serious set of shades, dude,” declared LaFranchi, who was born near Duvall and raised in the Admiral District. If you met him you might say he blends in with the public, but in his profession he certainly stood out in the crowd, literally. “Honest to God, most of this is pretty boring,” he said of guarding VIP’s, with modesty in his voice. “You’re standing in one place for a long time. You’ve got to be very aware of what’s going on around you, situational awareness. You see people walking down the hall and you get a sense of who might be a problem. Short of telling those you guard you want them to go that-a-way you don’t talk much. You don’t carry his bags. You guard him. In addition to the sunglasses, LaFranchi wore a bulletproof vest and was armed with a .357 Magnum “in the old days,” and then a 9mm pistol. On Aug. 19, 1974, Rodger Davies, then the Ambassador to Cyprus was assassinated. Then there was the African nation of Chad, just south of Libya. A civil war broke out in 1980, with one side backed by Qaddafi. LaFranchi was stationed at the American embassy there at the time. “We left in the middle of the night,” he recalled. “We returned eight months later to check the embassy to see if we could find any classified documents and bring them back across to Camaroon. Grenades had been thrown over the embassy walls. There were holes you could walk through on the side of the building. And some explosives needed to be diffused. But there was still shooting around the embassy. While I was there, rebels outside the city were shooting Howitzers. As a teen, LaFranchi left West Seattle to study in three Franciscan Seminaries. “I spent five years studying for the Catholic priesthood, but that didn’t take,” he said. But I learned Spanish, Latin, and Ancient Greek. I then joined the Air Force. They sent me to Syracuse to teach me Russian. I also speak French, Portuguese, and studied Modern Greek, Dutch and German. Russian came in handy. “My job was anti-wiretapping in our embassies,” he said. “So no Russian wiretaps in our Moscow embassy, or in our other embassies in other host countries. I worked with our embassy in Moscow on counter-intelligence. “We’d been following Bin Laden for a long time. In 1996 when the World Trade Center was bombed for the first time, one of the primary architects of that was holed up in Pakistan. My people captured him, brought him back to the U.S. and he stood trial. “I am one of those people who believe that terrorism is a criminal act. It’s very difficult to wage war against a theory or practice. It’s the same sort of concept as the ‘war against drugs.’ I was brought up in the operation to believe terrorism is a crime. We got away from that (as a country.) We will get back to that eventually. He revealed that Nelson Mandela was his only protectee with whom he wanted a photo, and got one, which he still carries around. Why? Responded LaFranchi, "Because he was Nelson Mandela. Enough said."